February 1st is National Get Up® Day, a campaign launched by US Figure Skating to encourage and support individuals, whether they are skaters, gymnasts, tennis players, students or parents, to face life’s challenges by picking themselves back up and giving it another try to overcome and ultimately succeed. This campaign was introduced over two years ago with the goal of showing how much grit and determination figure skaters have, and to attract others to learn more about the sport with hopes of increasing membership and viewership. The Get Up® program offers a platform for everyone to share their Get Up moments and provide inspiration to others. It’s not just about skating but about every aspect of one’s life when faced with setbacks and learning to conquer and defeat one’s fears and doubts by not giving up. I support this campaign because I truly believe every obstacle has a hidden opportunity which can help enrich one’s learning and experience. When you fail, you grow and mature and gain valuable lessons from the painful situation. Despite the frustration and discouragement, you need to find encouragement and motivation to pick yourself up and get back on course and build resilience and persevere through adversity. How we handle failure is more important than how we handle success. Please remember that even the best skaters in the world fall and have struggled and experienced setbacks along the way. 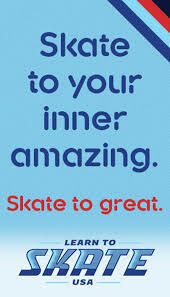 The upcoming celebration of National Get Up® Day could not occur at a more perfect time as I just started a new group session of Learn to Skate students. One of the very first lessons I teach my students is the importance of falling- how to fall and how to get right back up. Remember to always fall on one’s side and not forward or backwards and never use your hands to break your fall (please refer to My Essential Skating Tips For Beginners). Eventually you will learn and master the new skill and reclaim your power and when that time comes, you will be extremely proud and overjoyed of your accomplishment!